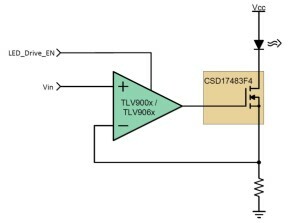 This reference design provides a design example for an IR LED driver for photoelectric measurement subsystems. The subsystem described includes a voltage-to-current converter based on an operational amplifier (op amp) and a MOSFET transistor for the active pass device to form the basis of an accurate and programmable current sink function. The use of the MOSFET transistor in this circuit allows several advantages which will be described and, most importantly, the opportunity to provide good current regulation in low-voltage, battery-powered systems. Similarly, the high input impedance and the high open loop gain of the op amp in feedback allows the circuit to achieve a flat response over temperature and minimal variation in output current due to changes in supply voltage.